Home › Home and Kitchen › Bullet Shaped Whiskey Stones - Chills Drinks - Stainless Steel Gift Set - 6 S..
Bullet Shaped Whiskey Stones - Chills Drinks - Stainless Steel Gift Set - 6 S.. THESE WHISKEY CHILLERS BLOW DILUTION AWAY - Stainless steel whiskey cubes perfectly chill spirits without diluting them the way that ice does! A SHAPE YOU'LL GET A BANG OUT OF - Our whiskey stones are shaped like bullets, making them more unique than conventional sipping stones! ARE YOU AIMING TO ENJOY A PERFECT GLASS OF SCOTCH, WHISKEY OR VODKA? You can't enjoy those premium spirits to the fullest unless they're perfectlychilled, but dropping a couple of ice cubes in your glass means you have todrink quickly before the ice melts and dilutes the taste of what you're hopingto savor. Fortunately, there is a way that you slowly sip a chilled spirit toyour heart's content without ever worrying about dilution, BarMe's AlcoholAmmo - Bullet Shaped Stainless Steel Whiskey Chillers. 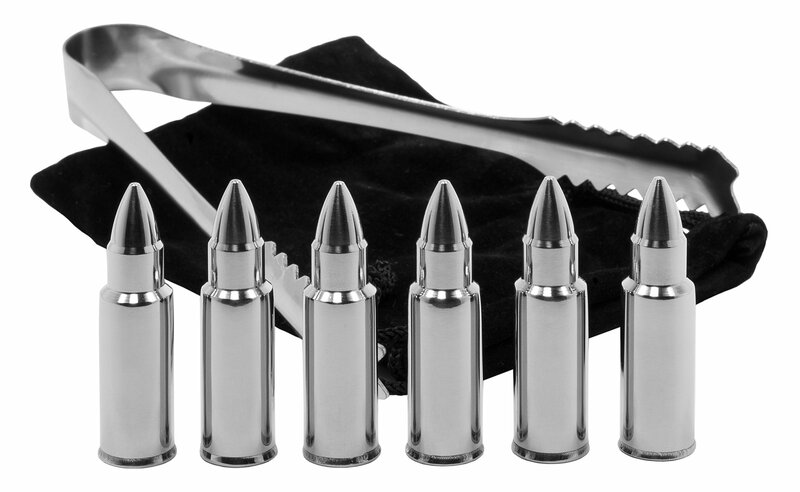 BARME BULLET SHAPED STAINLESS STEEL WHISKEY CHILLERS ARE SURE TO GIVE ANY SPIRITS LOVER A BANG! These stainless steel whiskey cubes get ice cold with just 3 to 4 hours in thefreezer and chill a drink in a matter of minutes, so you can enjoy yourspirits fast. Made out of 304 stainless steel, our whiskey stones make sippingdrinks fun with their unique bullet shape. The bullets fit easily into anytype of drinkware and their cooling properties mean you never have to worryabout diluted drinks. COMPLETE GIFT SET The BarMe scotch rocks bullets are sold in a complete whiskey gifts set thatincludes: - 6 x Whiskey rocks stainless steel bullets - 1 x pair of tongs for serving the whiskey stones - 1 x Whiskey rocks velvet bag for freezing & storage Enjoy your favorite spirits the way they were meant to be enjoyed--perfectlychilled with absolutely no dilution! CHOOSE THE BEST WHISKEY, SCOTCH AND VODKA GIFT SET ON AMAZON! Are you ready for classy, chilled, non-diluted drinks that are also aconversation starter? Order BarMe's Alcohol Ammo now!